This, and most salt in the average home, is commercial refined table salt, 99 percent sodium chloride. Sodium chloride is essential to human life and is important for regulating mineral balance, along with potassium and calcium. Salt regulates cellular water levels. But the table salt that most of us use has been processed and is not salt in its natural state. 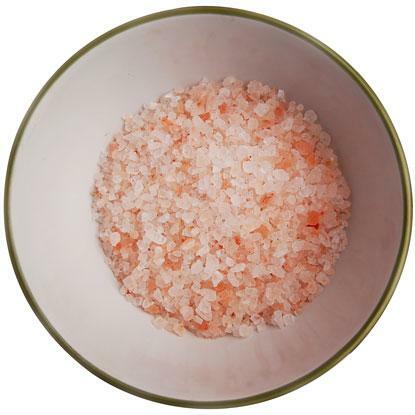 During the refining of table salt, natural sea salt or rock salt that has been mined is stripped of more than 60 trace minerals and essential macro-nutrients. It’s a processed food. Refined salt is also heated to such high temperatures that the chemical structure of the salt changes, and it is chemically cleaned, bleached, and treated with anti-caking agents (that’s why it pours so easily). Common anti-caking agents used in the mass production of salt are sodium alumino-silicate and alumino-calcium silicate. These are both sources of aluminum, a heavy metal that has been implicated in the development of Alzheimer’s disease. Refined salt is usually fortified with iodine, which is essential for thyroid function. Severe lack of iodine causes goiter (swelling of the thyroid in the neck), a result of the thyroid gland swelling. We’ve been led to believe that we need refined salt with iodine and that this is one of the only sources. Not so – sea vegetables and seafood are the perfect source for iodine, followed by dairy (yogurt, milk) and eggs. You don’t need to seek out refined salt fortified artificially with iodine to maintain a healthy balance of the mineral. Refined salt is just like refined sugar in the sense that they’ve both been stripped of nutrients and processed and are no longer whole foods. Do not consume refined salt! It is not supportive to good health and makes it more difficult for your body to achieve homeostasis and proper electrolyte balance. To avoid refined salt, do not consume processed foods (especially soups and microwave dinners), many of which are extremely high in refined salt that is added as a preservative. Avoid buying table salt at the store. Buy sea salt. There are many on the market, from plain old sea salt to fleur de sel, gray french sea salt, and Hawaiian sea salt (pink!). Many are coarse, but you can grind to make them fine. Since they do not contain anti-caking agents, they do not “pour” as easily and are best used in pinches. A pinch packs more punch than refined salt because it is the real thing! I love the Himalayan crystal salt, considered the highest grade of natural salt, and it contains 84 elements and helps your body maintain a healthy electrolyte balance. I’ll even add a pinch to filtered water, along with the juice of a lemon, for a natural sports energy drink post-workout. It also makes a great bath soak! you can buy coarse or fine. The natural sea salts are health-promoting and actually help your body maintain normal blood pressure. So, check your pantry and toss the refined table salt….. just another example of ridding your kitchen of refined foods and consuming whole, unadulterated foods, as nature intended! Interesting topic. I haven’t really considered salt in this way before, which is surprising since it looks so much like refined sugar-meaning both look so processed. I’ve found some processed salts to contain sugar, too. Strange! I use mostly sea salt, but at restaurants and in some packaged foods I am probably eating refined salt. I can’t believe I have not considered it before…. Here is a question for you: Since I have given up sugar my craving for salts as increased. It’s happened to someone else who gave up sugar, too. Your thoughts? Also, are there specific healthy brands of food that use sea salt in their packaged products instead of refined salt? If the ingredeints say “sea salt” is that all I need to know that the salt isn’t refined? Yours is a very good question. My best (succinct) answer is that it is not unusual when giving up a food (or substance) to have a craving displaced onto another food. For example, when alcoholics go sober, they often have intense sugar cravings (so many donuts at AA meetings!) as the body tries to get another source of sugar in place of all the sugar that alcohol provides. In the case you mention, refined sugar leeches minerals from the body, and now that the sugar is no longer a factor, salt cravings could be the body’s attempt to regulate and rebalance. Salt cravings represent low mineral reserves (take a mineral supplement and get more magnesium, zinc, and trace minerals) and also adrenal fatigue, both of which can be masked by sugar since it provides an artificial “lift” that minerals provide naturally. 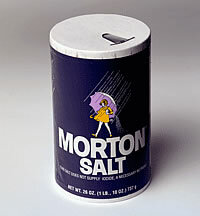 Maybe after I show him this article, my boyfriend will finally allow me to toss his Morton Salt. It did me no good to hide it! Just came across your blog-love it love it love it, thanks! I was about to pick up some Sea Salt at the grocery store yesterday. I’m glad I looked on the back because the ingredients read “refined sea salt”. I guess reading the labels will always be necessary. Love the blog, by the way. I check it regularly. Thanks for the comments, everyone. Marta – you raise a very good point! ALWAYS check labels on anything that you buy: just because it says “sea salt” does not mean it hasn’t been refined by heating, chemical additives, etc. Packaged foods of any kind that you buy at the natural foods store can be misleading. Even those that are labeled “organic” can still be processed and contain refined ingredients.